We compare the offers of more than 100 providers and find the best mortgage together with you. How much rent do you pay per month? 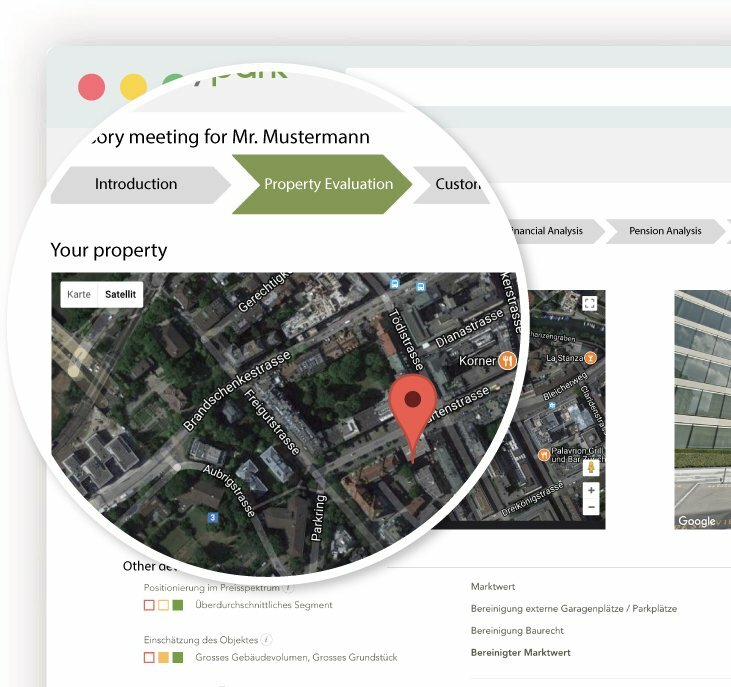 After the first contact, your personal advisor reviews your property project. Together we find the optimal financing solution for your dream home. We take care of all the paperwork and answer any questions you might have, even after the signing of the contract. ... and more than 100 other providers! Compared to the offer of their house bank, MoneyPark customers save on average CHF 2500 per year! Benefit from our services in one of our more than 25 branches in all parts of Switzerland or conveniently via online video advice. Our experienced advisors look forward to finding the best mortgage for your dream property. Learn more about our team. Learn more about why MoneyPark is independent and how we earn our money. The honesty as well as the competence convinced us very much. We don't need an advisor who just says "yes", but who advises us honestly and openly - even if it may be unpleasant. The advice from the MoneyPark advisor was very competent – he was extremely friendly, helpful and responded to our wishes. He quickly clarified our questions and no effort was too great for him. We are glad that he supported us in financing our mortgage. Thank you very much! Very competent, friendly and trustworthy advice. 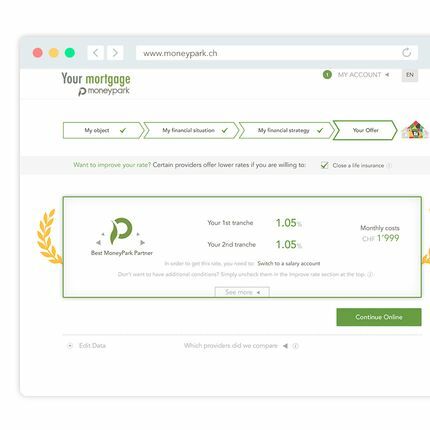 It is good that MoneyPark makes an important contribution to competition on the mortgage market. The price/performance ratio is good and fair. We are very satisfied with the result: We are about to move into our dream home thanks to an attractive mortgage. Also the much faster processing compared to other providers, friendlier advisors and better interest rates clearly speak for MoneyPark. Obtaining offers from various banks is not necessary with MoneyPark. My financing is now much cheaper than with my house bank. Very competent advice. Very competitive offers. Very time-saving. Not just standard advice, I was given all the information I needed – excellent. My level of knowledge was also taken into consideration. I am super satisfied with my advisor. I will keep him and MoneyPark in my best memory and recommend them to others at any time. Very competent, MoneyPark does not simply want to sell something, but offers real advice. In the process of our advisory service we provide you with a reliable, free-of-charge valuation of your property. We use the same valuation tools as banks, which means they will accept our valuation and you won't have to do it again. 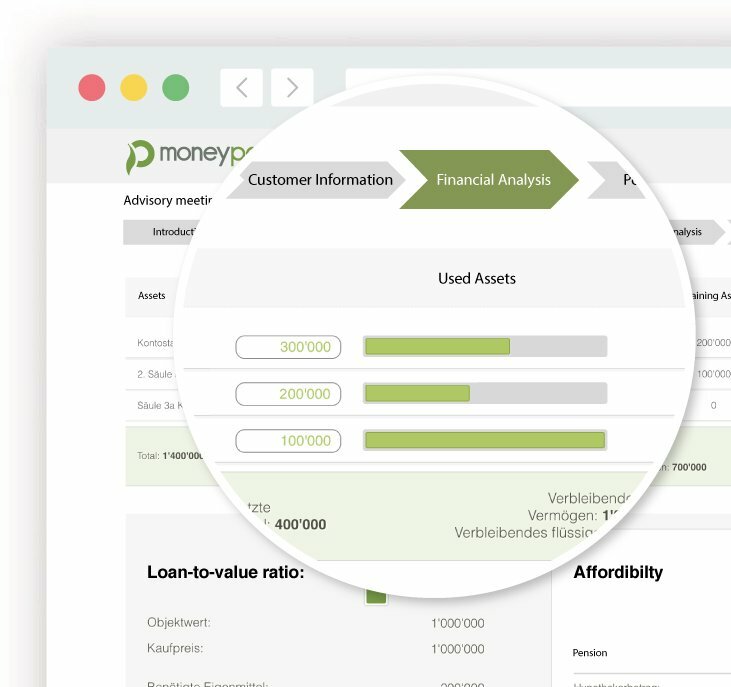 MoneyPark has developed Switzerland’s most technologically advanced advisory platform and refined it to perfection over the years. Thanks to it, our advisors are able to define the optimal mortgage strategy and find the best financing offer with maximum efficiency. Word has spread in the industry: More and more well-known providers are using our platform for their customers. 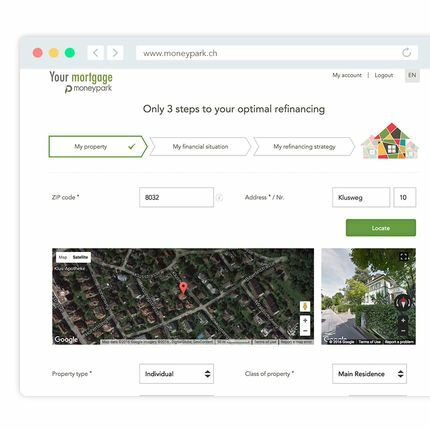 The MoneyPark refinancing solution allows you to get the best refinancing for your home in just 3 simple steps. Some basic information regarding your person, the property and the refinancing itself is enough to start the process and allows us to perform a free of cost valuation of your property. Benefit from Switzerland’s most comprehensive mortgage comparison. We compare more than 100 online and offline providers and find the best offer with a binding rate for you. 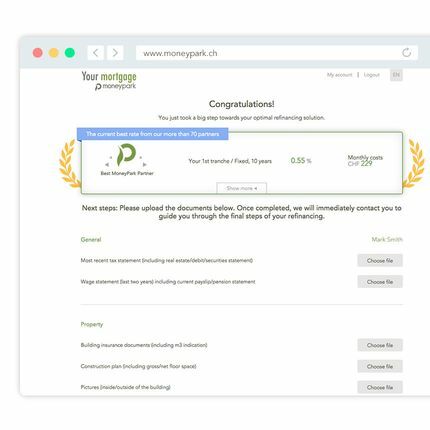 Now you can upload the required documents conveniently from your home. Later on in the refinancing process, these documents will allow us to take care of all the paperwork with the provider for you. 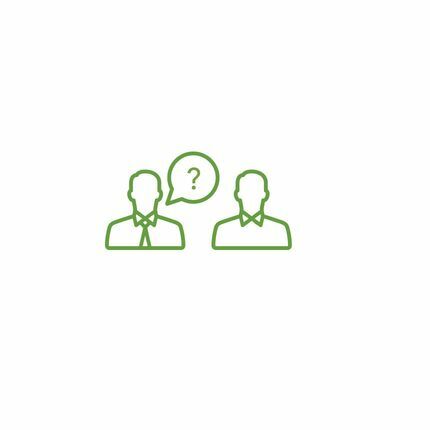 After completing the online process, one of our mortgage specialists will contact you to answer possible questions and discuss the next steps. The whole online process takes no more than 15 minutes and is structured in an easy-to-understand way. However, should you have any questions, you have always the possibility to contact one of our specialists who will then gladly guide you through the process. We guarantee the security of your data. Our processes meet the highest security standards and the transfer of data is always well encrypted. This is just one of many reasons why already more than 50'000 happy customers trust MoneyPark. The calculations we use on our website are based on standardized assumptions and are generally not able to consider your individual situation in detail. Therefore our tools and calculators provide you with guideline values, but only personal advice allows for exact results.